Federal Street land owner Charles Patsios praised Mayor Judith Flanagan Kennedy with helping him finalize a deal with Market Basket to build one of the grocery chain’s new stores in the city’s center next year. Patsios, a Swampscott resident, and Market Basket executives finalized arrangements Friday to move the 80,000 square-foot project forward. The deal came two days after Kennedy, Economic Development and Industrial Corporation Director James Cowdell and city Community Development Director James Marsh met with Patsios and Market Basket executives. 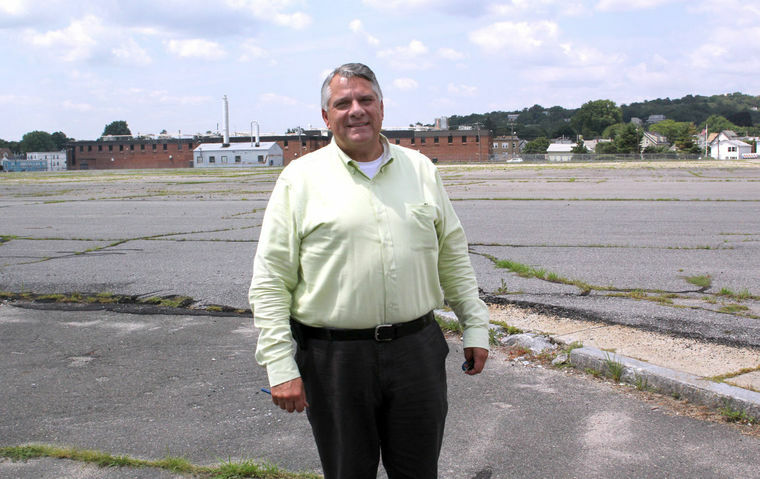 Charles Patsios stands on the site of the future Market Basket at the corner of Federal Street and Western Avenue in Lynn. “Market Basket is coming to Lynn,” Patsios said. “The participation of the mayor spearheaded this, and it turned out to be the catalyst. “Hats off to (Kennedy), Jim Cowdell and Jamie Marsh. They convinced Market Basket we are ready to go,” Patsios said. Without revealing the deal’s details, Patsios said the agreement centers, in part, around Market Basket’s relationship with Patsios as his tenant on the 24-acre GE Factory of the Future site. The agreement also outlines how the former building will be renovated into a new Market Basket, complete with a cafe. Kennedy and Cowdell, earlier this week, said store construction will start next summer. With Patsios and Market Basket reaching an understanding on site improvements, the city will concentrate on improving the site’s perimeter. Cowdell said the city will apply for a $3 million state MassWorks grant to pay for road, sidewalk and traffic signal improvements on the streets bordering the 24-acre site. He said Kennedy would call State Housing and Economic Development Secretary Jay Ash in support of the grant application. “We’ve been working with the owner of the property for two years. We look forward to the creation of 500 jobs and, hopefully, we look forward next month to equally good news about development on the Beacon Chevrolet (Lynnway across from North Shore Community College) site,” Cowdell said. Two years of negotiating between Kennedy and GE executives, that began in 2011, led to Patsios purchasing the Factory of the Future site in May 2013 — two months after the City Council voted to change the site’s zoning from light industry to business. Cowdell said Market Basket executives referred to that vote during Wednesday’s meeting, saying they were impressed with the city’s commitment to bring Market Basket to the Factory site. “We have worked for two and a half years on this project. We are looking at construction starting this time next year,” Cowdell said. In addition to seeking out infrastructure improvement money, the city will apply for tax incremental financing, Cowdell said, to assist Patsios in the project’s development. The TIF would ease the initial property tax burden associated with construction and improvements on Patsios’ site by spreading taxes over a 20-year period. “It’s exciting news Market Basket is back on track and the City Council looks forward to approving a TIF promoting 500 new jobs in Lynn,” said Council President Daniel Cahill.